Okay, so here is the big one, I hope it is not too nasty. Please give it a once over before Sunday and send me any modifications you think. I think this is a difficult task for the UN, but they are well supported. On the other hand the insurgents could get real nasty really fast. Should be fun. BIP: All fireteams carry explosives to Blast-in-place any heavy weapons or weapons cache. Air Support: Other than the UAV the two platoon commanders may attempt to call in air support. UN Special Reinforcements: On the turn following the turn that Akhbal Ta'ir Rajul spawns the UN player receives two bricks of Australian SASR (Leader, SAW, UGL, Sniper – TQ D10 Mor D10) which enter from any point on the edge. There objective is to capture/kill Akhbal. If Akhbal is captured/killed the UN player receives +8VP. Objective: No objective. VP are awared per insurgent team wiped out (1VP), per Heavy Weapon destroyed/captured (2VP), per vehicle destroyed (3VP) and Akhbal (8VP). The insurgent player receives 2VP per each UN KIA and 1VP for each UN Serious Wound. The UN player loses one VP each time a bomb is dropped, a Hellfire rocket is fired or a 105mm artillery strike lands. There is a general among his followers that Akhbal has the power of invincibility. He has a fanatical bodyguard and all his followers are fanatical (MOR12) while he is alive and onboard. The primary force is TQ6 MOR12, and his bodyguards (2ndaries) are TQ8 MOR12 Regulars. If Akhbar is killed or exits the area of play the MOR drops to 8. Akhbar himself is a non-combatant. A hotspot roll of 5 or 6 indicates regulars, any other result (1-4) indicates the reinforcements are foreign students. The UN regular’s mission is to destroy the arms caches (5pts ea) in the two compounds that are believed to be his new madrassa and destroy any heavy weapon/vehicle (3pts ea. plus + 5pts for the tank). The two compounds are the two that are closest to the centre of the board. If Akhbar is captured his followers become suicidal and are immune to Shaken, furthermore they will converge on his location. In all the turns following the turn Akhbar spawns and until he is killed, captured or leaves the area of play the insurgent player receives two Primary reinforcements per turn. * Primary Column: Until Akhbal Ta'ir Rajulh has spawned roll a D6 each time a Leader* is rolled, on a score of 5+ add a second leader to the squad, this is the unarmed Akhbal. The reinforcement automatically becomes his bodyguard and therefore are regulars. If Akhbal is alive, free and onboard roll two reinforcements on the primary column per turn. 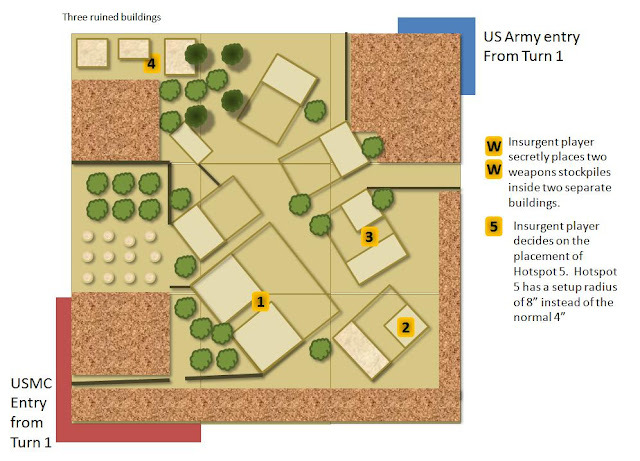 The Hidden Fortifcation is D6: 1) 3" trench, 2) bunker with GPMG and 2 regular crew, 3) A fortified compound with loopholes and a ratline of 12" from within the compound, 4) A minefield, 5) A 3" trench and a minefield, 6) A 12" ratline. Heavy Support Weapons for the Hilux are on a D6: 1-3 PKM, 4-5 RCL, 6 Dskha. The vehicles must be setup in terrain or enter from offboard from the board edge point that is closest to the selected hotspot (insurgents choice).